Many years ago I drew over 700 sprite images for a game (Last Guardian) that entered a competition but didn't win, so the sprites were never used. These are fantasy themed, and have 2 front, back, left and right positions, plus 2 genders and 2 skin tones each. 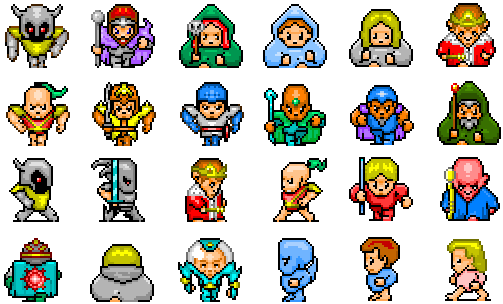 The sprites are 32x32 with a fixed 256 colors palette. My name is Philipp Lenssen and my website is outer-court.com . An appropriate link to the site and credit by name would be appreciated in your projects. Wow, wonderful! Thanks you Philipp! 700 sprites??? release the kraken! 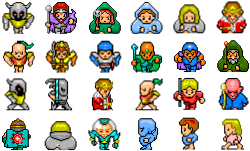 And to OP: You may want to upload the combined spritesheets as well, as they might be helpful for some. Cheers for your great sprites! Sorry powrtoch, i'm quite newbie with my mac, could you explain me how to use your nice script? Thanks for the great idea anyway! Powrtoch, cool idea, could you please hand me the resulting spritesheets zip so I can upload? i ame making a game atm ill be useing your sprites as characters. its a pokemon like game but with guns and swords and stuff like that. This is such a great resource. Thanks for letting the community use these. Um.. what licence do you want to go by exactly? Because here you say you want this Creative Commons Attribution 3.0 but in the zip file you say that you want something more closer to Creative Commons Attribution-Share Alike 3.0. And yes there is a huge difference. The FAQ explains that the difference is the can use commercially or not, with the project being open source when not. The license coming with the zip is still in there by accident (it was the one I had used years ago) and can be ignored -- I'll try to see if I can remove it. The license on this page is the new one. Thanks for noticing! Update: The revised zip with the license as listed here on the page is in now. Just wanted to know if you ever got around uploading the combined spritesheets that I provided you with as well. If you're too busy, do you mind if I upload them for you? I am sure others will find it helpful. Should I add this image to the zip? Sure! That's a perfect solution. Cheers for all the great sprites! Ok thanks. I was just concerned especially since no one had caught it and may have used your work already. Also apon looking back at my previous message I realize I sound a little jerk-ish I was assuming too much when I was writing it instead of just asking if that was meant to be that way, so I apologize if it did come accross that way. Powrtoch, can you re-upload that file somewhere? I could make good use of this, but the server is down. It's been ages since I've had it up there, and I don't have it around any more. You should be able to use the script I posted above though.